Can you identify any of the five people sitting on the porch? A black and white photographic print of Inverlynn house. There is a woman and three children seated on the verandah and a man standing further to the right. Inverlynn house is a house which is currently located at 1300 Gifford Street in Whitby, Ontario. The former address for this property was 816 Gifford street. Inverlynn house was built at the intersection of Raglan and Giffard Street in 1860 for William Laing (1818-1891). 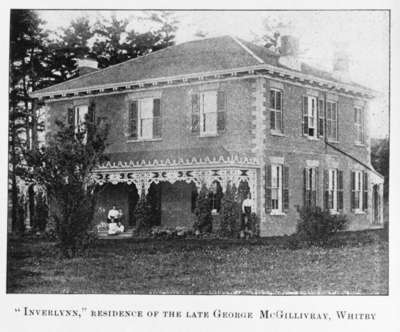 In 1870, the house was purchased by George McGillivray (1813-1894) and has remained in the hands of his descendants to the present day. The veranda around the house was replaced in 1922.